If you run track power out of doors, at one time or other you'll experience problems with electrical conductivity at rail joints. Joint problems can be reduced by using conductive paste in the joints, rail clamps, or Aristo track which screws together. However, each of these joints is a mechanical joint and the joint will eventually electrically fail. One sure way to ELIMINATE electrical joint problems is to solder jumpers across the joints. The upside is more reliable operation. The downside is that soldering joints is tedious work, and it somewhat complicates disassembly of the track. A lot of different ways have been described to solder rails together. In this page I describe only one of those ways, coincidentally it is the way that I did all my joints. However, I think that this is a good way. It is visually unobtrusive, fairly easy to implement, reliable, won't cause melted ties, it's cheap, and most important, it's effective. The joints on my railroad have been in service since the fall of 1996. Only one joint has failed or given me the slightest trouble since then and it was a bad joint to start with. If you haven't laid your track yet, consider using flex track that comes on long sections. 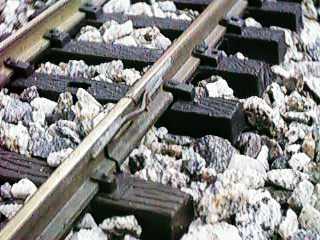 Long track sections have fewer joints to have problems, and more important, fewer joints that have to be soldered. The basic method is to solder a solid copper wire jumper across the rail ends on the outside of the rail head. The location of the joint is important. First, its easy to get to the rail head so that cleaning in preparation for a joint is easy. More important, the web of the rail restricts heat flow to the base of the rail so that the base doesn't get hot enough to melt the plastic tie strips. I've done literally hundreds of joints and I've yet to melt the ties. The wire jumper is short and not completely non prototypical. 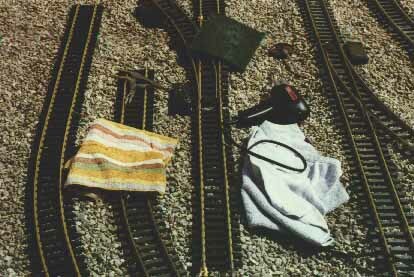 Real railroads often weld heavy jumpers across rail ends either for signaling circuits or for power return in a traction system. A solid copper wire works in this case because it has a stress relief loop. When the rails get hot, the gap between the rails closes. When the rail gets cold, the gap opens. Hopefully, you laid your rail on a warm day and closed the joints so that when it gets cold, the joints go into tension. This minimizes the tendency of the rail to buckle. On cold days, if a gap between the rails opens, the loop will collapse a little but there will still be enough wire left in the loop so that the solder joint doesn't get a lot of shear stress. The shiny copper wire and solder will soon dull in the weather so that the jumper will nearly disappear. After a month or so, you'll hardly notice them. When it comes time to take the joint apart for some reason, the wire jumper is simply cut at the middle. When it is time to rejoin the track, only then is it time to peel the old wire off. When the wire is peeled, it leaves a clean groove in which to place a new wire for resoldering. You'll need these tools to get started soldering track. A high power soldering gun or iron, 250 watts is good. 100 watt irons are an exercise in frustration unless you do your soldering in the hot sun with NO breeze. A reader of this page suggests that a smaller chisel tip soldering iron will work as well. The Weller D550 (or slightly larger D650) is a typical high power soldering gun that is available on the web or at most home improvement stores (typically in the plumbing section). A better way to do soldering on heavy metal items is a resistance soldering station. You can buy one for about $300 or you can build your own. Vance Bass has distributed a PDF file which describes how to make one from an ordinary automotive battery charger. Solder. I use SN63 (sometimes called 63/37 tin/lead) solder. It melts at a little lower temperature than the more common 60/40 solder and it flows a little better. SN63 is the only approved solder for spacecraft electronic assembly where I work. The solder can either be solid wire or have a flux core. I use a flux core solder so that I can easily use the solder elsewhere too. DO NOT use the "environmentally friendly" antimony/tin solder. This stuff doesn't work worth a damn. Soldering Flux. Use a NON CORROSIVE electronics grade paste flux. A couple of old towels to on which to rest your arms. Ballast really hurts when you place some weight on your elbows. A scouring pad. A green or brown ScotchBrite pad works fine. DO NOT use steel wool or a steel wire brush. The particles that fall off will become attracted to the magnets in your loco motors and really mess up the works. A small vice grip tool to clamp the jumper to the rail while you are soldering the first joint. A flat mill file for cleaning excess solder off the railheads. A spray bottle filled with rubbing alcohol for cooling the joint and for removing flux. A shop rag for use with the alcohol for cleaning up excess flux. A whole pile of preformed copper wire jumpers. Soldering is a process by which a low melting temperature alloy is allowed to melt and flow around heated metals. Under the right conditions, the solder will "wet" the metals to be joined and form a reliable electrical joint. A solder joint doesn't have a lot of mechanical strength so it is important that large mechanical stresses are not placed on the joint. There are several conditions that MUST be met to get a good solder joint. The solder used must be compatible with the metals to be joined. SN63 will wet brass, copper, tin, nickel, and nickel-silver very well. It will wet iron, steel and stainless steel marginally under ideal conditions. It will not wet aluminum at all. The materials to be joined must be ABSOLUTELY clean. A fluxing agent must be used to remove the last vestiges of contamination or oxidation on the surfaces to be joined. This flux usually only activates, or starts to work, when it gets hot so that both surfaces must be adequately heated before solder is applied. If the flux isn't boiling, it isn't hot enough. The solder must be melted and allowed to flow onto the cleaned, fluxed and heated surfaces AND be allowed to cool below its melting point BEFORE any movement of the joint is allowed. If ALL of the above conditions are met, then a good joint will be obtained. Miss one, and you've got a "cold" or defective solder joint. Ideally, the solder is applied to one or both of the surfaces to be joined, NOT to the soldering tool. If the surfaces are hot enough, they will melt the solder. The actual process is straightforward and simple. You'll be making a joint like the one in the photo above in no time. You should pick a warm, sunny day with little or no breeze as this makes for good joints, but perhaps at the risk of a cooked operator. Applying sun block to the back of your neck is not a bad plan. Even a little breeze will cool the joint very effectively and make soldering more difficult. Cut and form your wire jumpers. I use a 1-1/2" length of 18 GA solid copper wire. Form a 1/4" high by 1/2" long stress relief loop in the middle with a pair of needle nose pliers. Use the scouring pad to scrub the outside of the railhead for about 3/4" from the end of the rail in both directions from the joint. Scrub until the rail shines. Use the acid brush to apply a little paste flux to both rails where the joint is to be made. Clamp a clean wire jumper to the rail furthest from you. Bend and form the wire so that the free end lays right next to the rail head nearest you. Apply your soldering tool to the rail head and the wire and wait for the flux to boil. Even with a big iron, it may take 30 seconds or so. You may notice that the rail color changes to a copper color under the boiling flux. This is good, the rail is getting clean. Apply solder to the joint area and wait for it to melt. The solder should run both directions from where you apply it and fill in the joint. Apply enough solder so that solder runs from the end of the jumper to where it bends away from the rail. Remove the solder from the joint. Remove the iron from the joint. Wait about 5 seconds for the joint to harden. Pop off the clamp and immediately start on the second joint. Heat from the first joint will have migrated to the area of the second joint and it may go a little quicker. When the second joint is complete, immediately douse both joints with a spray of alcohol. Hot alcohol is very effective in dissolving excess flux and it cools the joint so that when you do the other rail, you don't lay your arm across a hot rail. Wipe the joint down with your rag to get off as much of the flux as you can. Flux is really good at crudding up loco wheels so if you don't get all of it off, you'll immediately begin to have real power pickup problems. Use your file to bend the loop of the jumper down below the top of the rail head if necessary. File off any excess solder that flowed onto the top of the rail. Give the area another spray of alcohol and another wipe with the rag. Move on to the next joint. To resolder a joint that has been separated, wait until it is time to resolder the joint before you remove the cut stub of the old wire. Peel it off with a pair of needle nose pliers, flux the groove where the old wire was and then follow the above process to resolder the new joint. You will want to add some new solder, but you won't need as much as when the joint was first done. Ripping the old wire off the old solder exposes metal that had been buried in the old joint and is already clean. Further the groove left behind by the old wire is perfect for cradling a new wire during installation.